At the end of a night that you don’t want to end……. One More Before You Go! Bringing together Scottish smallpipes and bagpipes, uilleann pipes, fiddle, whistles, accordion, guitar, mandolin, bass guitar and vocals, Dougal’s Jumper manage to fashion their own brand of cosy Celtic pop. Let Dougal’s Jumper wrap you up in their infectious mix of their own songs and some foot-stomping tunes. 2019 got off to a great start for the Band. They were chosen as one of the five bands from across Scotland to be part of the Hands Up For Trad ‘Battle of the Folk Bands 2019’ at Celtic Connections in Glasgow. 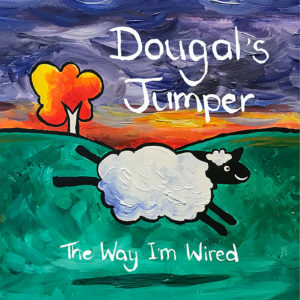 Dougal’s Jumper have just released their debut EP, ‘The Way I’m Wired’. Other performances have included the Speyside Whisky Festival, Jocktoberfest, live sessions as the house band for Moray Firth Radio’s breakfast show and various beer and gin festivals. Dougal’s Jumper are rapidly gaining a reputation for their energetic and entertaining performances and make it their business to get the crowd involved their festival-friendly set. Since forming in 2016, Dougal’s Jumper’s music has been played on radio stations from Fort William to Hawaii and many places in between. Based in Moray, Scotland, Dougal’s Jumper are; Catherine Stables, Maria Miller, Joseph Souter and Mike Reeves.